Published April 8, 2019 By Anna T. This post may contain affiliate links. Regardless, I only recommend sites I've researched and/or used and trust. Looking for work from home jobs that don't involve the use of a phone? Many people are — most often because of the “no background noise” requirement most phone jobs come with. Kind of hard to abide by that when you have kids and/or pets running around during the day! Fortunately, you do have lots of options! Below is a list of almost every non-phone work at home job I've reviewed here, with two links for each listing. One link will take you to the review of that company, and the other will take you directly to the page you need to sign up. I've kept each summary brief, but made an effort to include who can apply, pay rate, and how and when these companies pay where that info is available. If you want more work at home information, don't forget to subscribe to our twice-weekly newsletter. 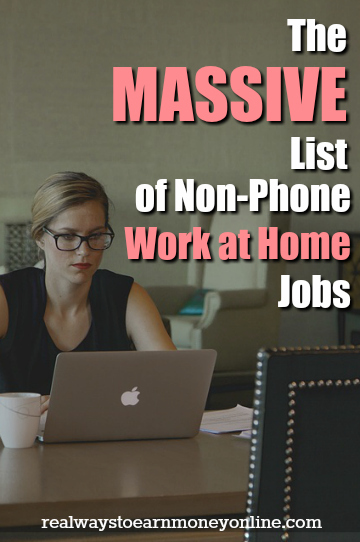 As thanks, you'll get a list right now of 15 companies currently hiring for work at home. Subscribe here. If you are a fast and accurate typist who doesn't mind repetition, you might excel at data entry. Clickworker – Read Clickworker Review – Very similar to Mturk (above). Has data entry sort tasks available on occasion. Dion Data – Read Dion Data Review – US only. Pay is per piece. The Smart Crowd – Read The Smart Crowd Review – Open worldwide. Pay is per piece. Payments are made via Dwolla. Xerox – Read Xerox Review – It's not uncommon to find data entry work from home jobs posted on Xerox. Type in “work from home data entry” on their careers page to see these listings. As with so many other data entry jobs, it may be location-based work. Ibotta – Sometimes Ibotta has a data entry position open, but it is only open to people living in Colorado. TTEC – Read TTEC Review – This company was formerly known as TeleTech. They occasionally have data entry jobs that are work at home. Part-time, pays $10 hourly. I also recommend FlexJobs for finding more home data entry jobs. With that site, you can regularly search legitimate work at home jobs for data entry and other industries. Every job lead is guaranteed scam-free, and it's the only membership-based jobs site I currently use and trust. Their listings are updated 5-6 times per week, and they are plentiful. You can currently get 30% off a subscription (it's already a low price, and when you add that, it's very low!) using promo code AFFILPROMO. If you're very focused, pay lots of attention to small details, don't mind repetition, and have impeccable spelling/grammar skills, then you might excel as a work at home transcriber. 1-888-Type-It-Up – US only, experience preferred, but new transcribers are welcome to apply. Pays $36 to $60 per audio hour. Get paid twice a month with Paypal. 3PlayMedia – Read 3Play Media Review – US only. Project-based work equivalent to $10 to $30 hourly. Get paid monthly with direct deposit or mailed check. AccuTran Global – Read AccuTran Review – US and Canada only. Prefers experience. Pay is per word ranging from $0.005/word to $0.0066. Get paid once a month via check or wire transfer. Babbletype – Read Babbletype Review – Open worldwide, experience not needed but must pass test. Pays per audio minute, between .40 cents and $1.00 depending on difficulty. Get paid weekly with Paypal. Daily Transcription – Read Daily Transcription Review – Another company willing to accept novice transcribers. You work for them on an “as needed” basis. Focus Forward – Read Focus Forward Review – US only, experience needed. Pay is $10 per 15 minutes of sound transcribed, or higher if you are transcribing foreign languages. Get paid bi-monthly with check or direct deposit. GMR Transcription – US only, no experience needed. Pay rate is not disclosed. Net Transcripts – Read Net Transcripts Review – US only, experience preferred. Pay info not listed. Quicktate – Read Quicktate Review – US and possibly other countries. Pays between 0.0025 per word and 0.0050 per word. Get paid weekly with Paypal. Scribie – Read Scribie Review – Open worldwide, no experience needed. Pay is $5 to $15 per audio hour. You can withdraw your earnings to Paypal at any time once your work has been reviewed. SpeakWrite – Read SpeakWrite Review – Open to US and Canada. Experience required. Pay is 1/2 cent per word transcribed. Get paid twice monthly via check or direct deposit. Tigerfish – Read Tigerfish Review – Open to US. Experience may not be needed. Pay is per line transcribed. There are very few other details provided. Transcribe.com – Read Transcribe.com Review – US only. Experience may not be needed. Pay varies. Get paid daily via Paypal. TranscribeMe – Read TranscribeMe Review – Open worldwide. No experience needed. Pays $20 per audio hour although this may vary depending on the project. Get paid weekly with Paypal. Transcription For Everyone – Often hiring transcriptions, no experience necessary. US. Can level up to editor after transcription experience. Ubiqus – Read Ubiqus Review – May be open worldwide. Experience preferred, but not required. Pay rate not listed. Get paid every two weeks. Verbal Ink – Read Verbal Ink Review – Pay is per audio hour, experience is preferred. Way With Words – Read Way With Words Review – Open worldwide, rate of pay not provided. More transcription companies listed here. Afraid you'll dive into transcription, not really knowing what you're doing? You can get the Jump-Start Your General Transcription Career eBook on Amazon for a basic walkthrough of what general transcription involves. I've read this book and it's amazingly helpful! Something else I recommend is taking the free 7-lesson mini-course on general transcription offered by Janet Shaughnessy of Transcribe Anywhere. This will help you to understand if you're a good fit for a transcription career, what you can potentially earn, and also where to get started. And if medical transcription is what you're leaning toward, I recommend CareerStep for training. Freelance writing is one of the most flexible of the non-phone options, and it's an easy field to break into without any experience at all! This is also an industry that can pay well, especially if you forgo content sites (such as the ones below) and work on finding private clients that will agree to the rates you set. The content sites I've listed below may not pay that well, but they can still help you get valuable writing experience and earn a weekly paycheck. Verblio – Read Verblio Review – US only. Pay ranges from $8 to $72 per post. Get paid weekly with Paypal. Boost Media – Read Boost Media Review – Open worldwide. Rate of pay varies. Pays via Paypal. Buy Keyword Articles – Read Buy Keyword Articles Review – US only. Rate of pay varies, but they state most of their writers earn between $10 and $18 hourly. Pay is every two weeks via Paypal. Crowd Content – Read Crowd Content Review – Open to US, UK, Canada, and Australia. Pay ranges from 1.2 cents to 7.6 cents per word. Pay is every second Friday via Paypal provided you've reached the $10 cash out threshold. The HOTH – Anywhere in the US. No previous professional writing experience or education necessary, but you must be a native English speaker. Pay varies depending on skill level, but according to Glassdoor, most make around $15 – $17/ hour. Online Writing Jobs – Read Online Writing Jobs Review – US only. Pays around $15 per article. Payments made weekly via check or Paypal. Scripted – Read Scripted Review – May be open worldwide. Pay varies depending on the assignment, but could range between $10 to $25 or more. Get paid weekly via Paypal. Textbroker – Read Textbroker Review – Open to US and some other countries. Pay depends on your star rating when you apply. Pay ranges between a seventh of a cent per word and five cents per word at the highest level. Pay is weekly via Paypal provided you have at least $10 in your account. Words of Worth – Read Words of Worth Review – Open to US, Canada, and possibly other countries. Pay rates are not listed on the website, but it will vary depending on the assignment. Get paid once a month via bank transfer. Writer Access – Read Writer Access Review – US only. Pay rates range between 1.4 cents to 7 cents a word. Get paid weekly if you opt for direct deposit payments, or bi-monthly if you opt for Paypal payments. More writing sites listed here. If you're serious about starting a freelance writing business and would prefer to avoid the lower-paying content sites I listed above, you can get a FREE no-strings-attached list of 200+ writing niches and sub-niches from Gina at Horkey Handbook. This will help a lot when you get started and you're unsure what to specialize in. One thing to keep in mind about editing and proofreading jobs is that most of these will require that you have either a degree, or a degree in a related field. Cactus – Read Cactus Review – They offer highly specialized freelance editing work regularly. Scribendi – Read Scribendi Review – Open to US and other countries. Rate of pay not listed, but will depend on word count and turnaround time. Pay is via Paypal. Lyft – Read Lyft Review – Give people rides via the Lyft ride-sharing app. This one is growing in popularity! Get paid daily or weekly. Shipt – Read Shipt Review – Be a shopper for Shipt, delivering groceries on-demand for people who request the service. Shipt claims it's possible to earn $22/hourly, but around $10 is more likely according to reports from many Shipt shoppers. Instacart – Read Instacart Review – Get paid weekly to shop for, and deliver, groceries to people who need them. They have two positions — one that requires a car and one that does not. DoorDash – Read DoorDash Review – Get paid to pick up food orders from various restaurants that use the DoorDash service and deliver it to the people who ordered. Postmates – Read Postmates Review – Become a “Fleet delivery driver” for Postmates and get paid for deliveries of all kinds of items. You take home 100 percent of what you earn and payments are made weekly or cash out when you want instantly. While ESL tutoring is technically non-phone, you do still have to interact with students online, helping them learn the English language. You may need a webcam so the students can see you as you teach them. ESL tutoring may be a fit for you if you have some past teaching or tutoring experience along with a degree or at least some college under your belt. These companies pay well — sometimes more than $20 an hour. EF Education First – Read EF Education First Review – US and UK. Must be a native English speaker with a bachelor’s degree in any field. TEFL certification is required, and can submitted when applying or at the start of your contract period. You'll also need a quiet workspace with a wired internet connection and headset. Pay is $12 – $19 / hour. SayABC – Read SayABC Review – Open to US, Canada, and Australia. Must be a native English speaker with a bachelor's degree or above. Earn up to $21 hourly. Cambly – Read Cambly Review – Webcam tutoring. You can teach English online without a degree, and you can work anytime! Currently they need English & Spanish language tutors. This is informal tutoring — you're mostly doing social chatting. Also, check out my Cambly review if you need more info. VIPKid – Read VIPKid Review – Earn between $14 and $18 hourly tutoring Chinese children in English. Magic Ears – US & Canada. Provide online English tutoring to 4-12 year old children in China as an independent contractor. Work at home or from anywhere with a speedy internet connection and earn $18-26 an hour. Bachelor’s degree or current college enrollment is required. NiceTalk – Read NiceTalk Review – Worldwide. Applicants with TEFL/TESOL/CELTA certificate or IELTS/TOEFL teaching experience will be preferred, but it is not required. You'll need a smartphone and speedy internet, as well as a quiet environment for your tutoring sessions. Pay is $10 / hour. I also want to make clear that even when you do phone work as a virtual assistant, lots of times it can be arranged so you're making the calls during times of day when it's convenient for you. Contemporary VA – Read Contemporary VA Review – May be open worldwide. Pay is $10 hourly. Get paid every other week via mailed check. Belay Solutions – Read Belay Solutions Review – US only. Pay rate is not advertised. Fancy Hands – Read Fancy Hands Review – US only. Pay is per task and I've seen where some people claim they make anywhere from $2 to $10 an hour just depending on what tasks they choose. Pay is every other week on Tuesdays via Dwolla. Time, Etc. – Read Time, Etc. Review – US and UK only. Earn between $11 and $16 hourly. Get paid monthly with Paypal. Worldwide 101 – Read Worldwide 101 Review – US and UK. Pays between $15 and $20 hourly. Get paid once a month by (I think) direct deposit. Startups.co – Formerly known as “Zirtual”. They have virtual assistant openings for different timezones, US only. Pays $13 to $18 hourly. A minimum of an Associates degree is required. If you want to get your wheels turning and figure out exactly what services YOU could offer as a virtual assistant, this list here has over 150 ideas! It's totally free. I also recommend the e-book 21 Days to a VA Biz. Note that this book focuses on starting your own virtual assisting business rather than working for a company (such as the ones above). If you are good with numbers, you could work at home as a virtual bookkeeper or accountant. While this can be non-phone, you may occasionally have to converse with clients via phone to get questions answered about their situations. However, many bookkeepers and accountants have clients who are happy to stick to email communication only. Accounting Department – US. They hire virtual accounting specialists to work remotely. They do require 3+ years of bookkeeping experience. Bateman & Co. – US, Texas residents preferred. They hire remote staff accountants. You must have a CPA to be considered plus three years of public accounting experience. Belay Solutions – Read Belay Review – US only. While this company is best-known for hiring remote virtual assistants, they do sometimes have remote bookkeeping jobs open as well. See more work at home accounting and bookkeeping companies here. Another option is to work for yourself as a bookkeeper. It is possible to earn $80+ hourly with your own virtual bookkeeping business without going into debt. Here's a helpful resource to help you learn how that works! You might excel at search engine evaluation if you're great at internet research, up on pop culture, media, current trends, and you know your way around the computer. You do not necessarily need any past experience to do these jobs, but all of these companies will require you to complete a rather lengthy test prior to accepting you. Appen – Read Appen Review – Open worldwide. Pay will vary depending on the job you're doing for Appen. Search engine evaluators may make around $13 – $15 hourly. They pay monthly via check or direct deposit. iSoftStone – Read iSoftStone Review – May be open worldwide. Pay may be around $12 hourly. Get paid once a month with Paypal or direct deposit. Lionbridge – Read Lionbridge Review – Open worldwide. Pay is around $13 hourly or more. Get paid once a month with direct deposit. KarmaHub – Read KarmaHub Review – US only. Pay is around $11 hourly. Flexible schedule. You can go here for more listings and search engine evaluation resources. One thing to keep in mind with these jobs is that the companies above will have strict NDA's to sign. They don't want you sharing information about what you're doing or even how much you earn publicly. Also, most of them will not allow you to work for them if you are also working for one of their competitors. Short tasks are often just extra money and rewards, but it's something a lot of people do to fill in the gaps between other types of work from home jobs. The tasks available will vary from site to site. This is in many ways comparable to data entry because a lot of the tasks will involve typing. Swagbucks – Read Swagbucks Review – Open to US, UK, and Canada. While this is just extra money or regular Amazon gift codes, there are tons of tasks you can do to earn daily — everything from paid surveys to watching videos. I've been a member since 2007 and can vouch for the company. They have paid me many times. It's definitely a fun site to use. Amazon mTurk – Read Amazon mTurk Review – Open worldwide, but you can't get paid in cash unless you're in the US — you have to opt for money in your Amazon account. Pay varies depending on the tasks you choose. Payments are made via bank transfer or you can get money to spend on Amazon instead. Appen – Read Appen Review – Open worldwide. I have this site listed above under “search engine evaluation,” but I'm listing them here, too, because they also hire people as “crowd workers” to do short tasks. ClickWorker – Read Clickworker Review – Open worldwide. Pay may amount to around $9 hourly. Pay is once a month via Paypal, or you can get paid with bank transfer if you are outside the US. OneSpace – Read OneSpace Review – Open worldwide. Pay varies depending on the types of tasks you're completing. It is also possible to get paid via Paypal very quickly once your tasks are approved. Check out more short task sites here. You've probably noticed that most companies nowadays offer ways to for their customers to contact them instantly via live chat support. Many of these chat support agents do work from home. Below is a list of the companies I've reviewed on this site that have occasion openings for work at home chat agents. You might make a great chat agent if you're a multi-tasking pro, very computer literate, have great customer service skills and/or past customer service experience, and you can type quickly. Apple – Read Apple At-Home Advisor Review – Open to US. Pay rate not listed, but it's rumored to be in the teens. Ginger.io – Read Ginger.io Review – Open to US. Contract jobs that will require a degree in a related field. You work at home providing mental health services to people who need it via chat. You can find more companies occasionally hiring work at home chat agents here. Another popular (mostly) non-phone job is online academic tutoring. This is often done via chat over the computer rather than by phone, but different companies will handle the communication in different ways, so you may want to double-check how you're communicating with the students prior to applying. You might make a great tutor if you're patient, good at explaining academic concepts, friendly, and you have past experience tutoring/teaching. Also, many of the companies below will require either a college degree or that you be currently enrolled in college. Brainfuse – Read Brainfuse Review – Open to US, not sure about other countries. Pay is around $10 per tutoring session. Get paid every month via direct deposit. PrepNow – Read PrepNow Review – Open to US. Pays $15 or more per hour. Yup – If you are a math, chemistry, or physics expert, you can get paid to tutor on your own schedule and earn money with Yup. Work from anywhere. Tutor.com – Read Tutor.com Review – Open to US and Canada. Pay is between $9 and $13 hourly during tutoring sessions. Aim-4-A Tutoring – US only. Must have a bachelor's degree. There are more companies that hire online tutors listed here. ETS – Read ETS Review – Open to US and occasionally other countries. Pay may be between $10 and $20 hourly depending on the project. Payments are made twice monthly. Measurement, Inc. – Read Measurement, Inc. Review – Open to US. Pay may be around $11 hourly. Pearson – Read Pearson Review – Open to US and people authorized to work in the US. Pay is $10 and more per hour. Get paid via direct deposit. WriteScore – Read WriteScore Review – Open to US only. It's possible to earn between $8 and $15 hourly depending on your speed. There are a few more companies that hire remote test scorers here. Social media managers and moderators are in charge of managing forums and social media platforms for businesses and/or people who need the help. You'll be expected to do things like respond to comments, delete inappropriate comments, lock threads on forums when appropriate, etc. Crisp Thinking – Read Crisp Thinking Review – Open to US and some other countries. May pay between $10 and $15 hourly for social media moderation work. The Social Element – Read The Social Element Review – Open to US and worldwide. Pay rates are not listed, but are said to be competitive. Rumored to be around $15 an hour. ICUC – Read ICUC Review – Open worldwide. Pay starts out at $10 hourly, but opportunities for advancement and higher pay are available. This company prefers candidates that speak more than one language. LiveWorld – Read LiveWorld Review – Open worldwide. Most people start out making between $8 and $10 hourly. The exact amount is dependent on your location. Get paid every two weeks with either a mailed check or direct deposit. Note the job is not always posted on their website. Metaverse Mod Squad – Read Metaverse Review – May possibly be open worldwide. Pay may start at around $8 hourly for moderators. Get paid monthly on the 15th. Lithium – Read Lithium Review – Has occasional openings for remote social media moderators. According to Glassdoor, this job pays around $12 hourly when it is open. We have a list of more companies that hire work at home moderators, and some additional general information on doing social media work from home. Translation work may be an option for you if you bilingual or multi-lingual with great grammar and spelling skills. Gengo – Read Gengo Review – Open worldwide. Pay is between 3 and 8 cents per world translated. They pay twice monthly with Paypal. TextMaster – Open worldwide. Earn between $1.30 to $9.75 per 100 words translated. Pay is via Paypal. Verilogue – May pay around $5.10 per audio minute. Get paid twice monthly with check or direct deposit. You can check here for more work at home translation companies. You can work from home giving your expert advice on various topics to people who need it. If you can prove your expertise in a certain field, then you may qualify to do this work, although for some it's just extra money here and there. This is often non-phone because you may be able to give your advice via email or chat. Ask Wonder – Read Wonder Review – Open worldwide. Get paid to create write-ups using your expertise and research skills. Maven – Open worldwide. You get to choose your rate. You must have at least $25 in your account to get paid, and you can choose from mailed check, bank transfer, or Paypal. Just Answer – Pay rate varies depending on how much a person is willing to pay for an answer. You can cash out your earnings to Paypal once you have $20 in your account. Many more question/answer paid expert sites here. These are non-phone jobs that I don't really have a category for. Humanatic – Read Humanatic Review – This is a company that has you analyzing recorded phone conversations. Pays very little — so little in fact that most people just do this as a side egg. You can get paid once a week via Paypal. Kirkus – Often looking for book reviewers. Worldwide. Seeking reviewers for both English and Spanish titles. Reviews are about 350 words, due two weeks after the book is assigned. Pay is $50 per review. Shutterstock – Read Shutterstock Review – May be open worldwide. This popular stock photo company has occasional openings for remote image reviewers, where you determine which submitted photos should make it onto the Shutterstock website. Pay and other details are under wraps — workers are required to sign an NDA, so it's hard to find many details online. Stitch Fix – Read Stitch Fix Review – Open to US only, specific states. You can work for Stitch Fix as a work at home stylist, putting together clothing subscription boxes for their clients. Should be non-phone, paying around $15 hourly. Just Looking For Extra Cash? Extra Cash & Rewards (my sister's site) has a great list of sites that pay you fast. They're only good for extra money, but they are reputable companies. Don't forget to sign up to get a FREE extra cash newsletter as well. 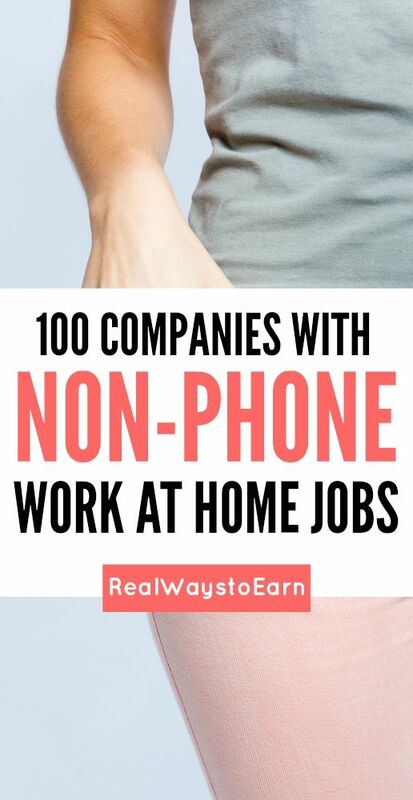 My e-book, How To Find REAL Work From Home Jobs, contains 150 legit companies, specific instructions on finding work at home jobs yourself, and also many, many resources you can trust for searching/following. You can get all the great info inside for a small price of just $5! Post originally published October 20, 2012. Updated and republished April 8, 2019.